Design and develop websites like a pro with our web development course. We offer a scenario-based online course packed with whiteboard videos, interactive quiz, programs, interview questions, best practices, methods to avoid errors and fun facts about web development. 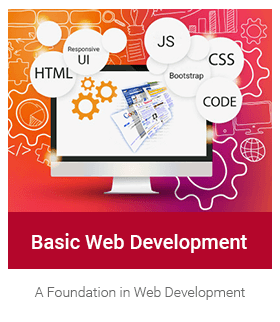 The course opens up the doors to a flourishing career in responsive web development. Learn how to plan the design of your website and webpages with basic web page layout, Creating sitemap, Web design phases and principles and information gathering. Gathering information for the content of webpages. Create webpages and add text to the pages. Format text and lists using various HTML tags, HTML Sections, Basic tags, adding text to webpages, with formatting and aligning tags, adding lists, header tags and line break tag. Don’t miss our important section on website audience, metadata, metatags, hyperlinks and overview of SEO that gives your website a higher ranking on search engines. You will also study how to add anchor tag, tables, sections and section element tags. Add images, audios and videos to webpages. Also, create image maps to link the image to webpages or media. Use additional features of HTML 5 in your webpages. Study features of HTML 5 DOCTYPE tag. We then enter the world of responsive web development. Understand the meaning and need for responsive UI, create responsive web pages using the elements like grid system in CSS. Learn about elements of Responsive UI like fluid grids, media queries, grid layouts, flexible images and media, media queries and CSS grid system. Lets make our websites even more responsive with grid layouts using CSS, background image and color, multiple background images and manipulating its size. Introduction to Bootstrap and Bootstrap grid system. Add navigation bar or header to your homepage with BootStrap navigation bar, add a slider using carousel plugin, use media queries to resize your webpages and elements based on user’s device. Learn the basics of domain, URL and web hosting. We finish with a lesson on domain, URL, Web hosting, types and selecting the right web host.